The players voted from a list of finalists and Swiftwing has won the grand prize, a custom PC from Smooth Creations. Great job…stay tuned for our next City of Heroes contest! Palit and AMD have partnered with City of Heroes® to offer the "Create a Character" Costume Contest! 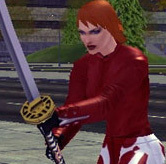 This contest was started at the crossroads between City of Heroes Costume Creator and ATI's signature character, ATI Agent Ruby. 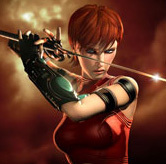 You see Ruby, the character featured in a number of ATI Radeon™ technology demos has been known to swing a sword or two. As such, she translated well into a City of Heroes character! After making Ruby into a City of Heroes character, we wondered just what other unique characters could be made! It seemed a natural progression to see who could make the best and most interesting, unique character of their own! The name and server of your in-game hero/villain. Please attach the screenshot of this character to the email. Note: Should you win, this is the character that will receive the in-game title! If you are a member of the City of Heroes Message Forums, please include your registered message board display name. Three screenshots of the contestant's in-game hero/villain that best display's their character's outfit. Consideration should also be given to the screenshot's background and having it fit with the character's story. All three screenshots should be the character in the same pose, just taken from different vantage points. One screenshot of the contestant's in-game biography. In the game, go to the menu and then to your ID and write out your character's biography. Space is limited to what is available in game. You can view your bio for the screenshot by going to the in-game menu and choosing to display your personal info from the drop down list. The 5th and optional attachment can be an action screenshot of the character. All attachments must be in 800x600 resolution or better and in .jpg file format. ONLY attachments in .jpg format will be accepted! For suggestions about taking great screenshots, we have created a thread on the Official Message Forums Screenshots and Fan Art section. Please visit that forum for more input. We recommend that contestants have Anti Aliasing enabled on their computer and set it to display the maximum possible resolution available. Entrants should crop their screenshots so that only the main character and the immediate background are visible. All entries must be received via email prior to 11:59 pm (Central Time) October 17, 2008 (the "Contest Conclusion") and must be in English. No other methods of entry will be accepted. Limit: one entry per person. Entries will be judged primarily on the quality, cohesiveness and creativity of the character's costume. Secondary considerations will be (in order): the character's biography, the quality of the submitted screenshots and the appropriateness of the character screenshot's background. To promote the event, we are planning on visiting each server between October 1st to October 17, 2008. This will happen one time on each of the 11 North American City of Heroes servers. 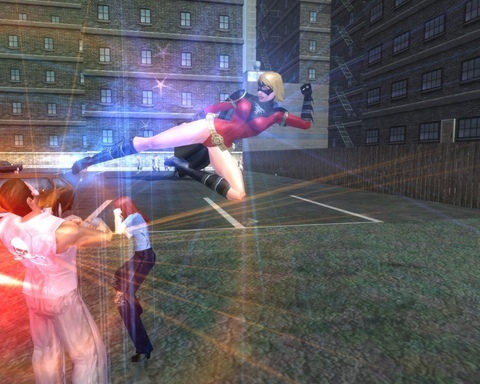 During each in-game event, players logged on at the time will have the opportunity to visit with ATI Agent Ruby along with members of the City of Heroes Community Team in Pocket D.
The Winner of the Palit video card will be selected based on the quality of the character's costume and secondarily on their bio and how they act (are friendly and fun) when we meet them. Winners of the in-game event will be notified in-game by a member of the Community Team in attendance. Additionally, we will notify them via e-mail too. Should the winner decline to receive the card for whatever reason, we may select another winner or save the card for another showing at a different time. All entries must be received via email prior to 11:59pm (CDT), October 17, 2008 (the "Contest Conclusion") and must be in English. No other methods of entry will be accepted. Limit: one entry per person. Sponsor is not responsible for lost, late, incomplete, incorrect, unintelligible or misdirected entries, which will be void. Use of a false name, username, mailing address or email account will disqualify an entry and the individual who submitted the entry. Use of obscenities, racist, sexist, hateful or other material or depictions that, in Sponsor's judgment, are inappropriate or offensive, will disqualify an entry. Sponsor is not responsible for hardware or software malfunctions, lost or unavailable network connections, or failed, incorrect, inaccurate, incomplete, garbled or delayed electronic or other communications. Sponsor, in its sole discretion, can disqualify from this contest and any other contest conducted by Sponsor, any person who, in Sponsor's reasonable suspicion, tampers with the entry process or the operation of the web site, or who otherwise violates these rules or any of part of the City of Heroes® or City of Villains® User Agreement. Sponsor has the right to terminate, suspend or modify this contest, in whole or in part, at any time and without prior notice, if, in Sponsor's judgment, the contest is altered, corrupted or cannot be completed as planned due to computer virus, bugs, tampering, unauthorized intervention, technical failures, or other conditions beyond Sponsor's control, or at Sponsor's reasonable discretion. Incomplete entries are invalid, and contestants with incomplete entries will be disqualified. To enter the contest as of October 1, 2008, (a) you must be 13 years of age or older, (b) you must have Internet access, an email account and access to a personal computer, (c) you must be a legal resident of the United States (excluding the State of Rhode Island, and excluding Guam, Puerto Rico, U.S. territories, military installations and commonwealths) or Canada (excluding Quebec) (Canadian residents will be required to answer an additional mathematical question in order to claim their prizes), and (d) you must be a current City of Heroes® and/or City of Villains® subscriber (meaning you must have an active account). Employees of Sponsor, and its parent company, affiliates, subsidiaries, representatives, advertising, promotion and publicity agencies and members of the immediate families (defined as parents, children, siblings and spouse, regardless of where they reside) or households of such employees are not eligible. Contest is void where prohibited, restricted or taxed by law. All federal, state and local laws and regulations apply. The contest period begins at 2pm (CDT) on October 1, 2008, and ends at 11:59pm (CDT) on October 17, 2008. Those entries will then be posted to the City of Heroes website on October 24, 2008 where the public is allowed to vote on them. The public will have until October 30, 2008 to vote. The grand prize winner of the custom gaming PC will be announced on or about November 14th, 2008. There are a total of 24 available prizes. If winner cannot be contacted at the email address they submitted, or is contacted and does not respond by signing and returning to us for our receipt within the time indicated on the documents, an Affidavit of Eligibility (or, in Canada, a Declaration of Compliance with Contest Rules) and Liability/Publicity Release, or refuses or is ineligible to accept prize, the prize may be awarded to the next highest ranking entrant on or about November 7, 2008. Any prize not claimed by one alternately chosen winner will not be awarded. Prizes are not transferable. No substitution of prize for cash or other goods and services is permitted, except Sponsor reserves the right to provide a substitute prize of approximately equal value. Taxes on prizes (including, without limitation, income and sales taxes), if any, are the sole responsibility of the individual winners. If a winner is under 18 or a minor in his or her state/province/country of residence, his or her parent must also sign the applicable release and documentation. Winners will have their winning screenshot/photo entries and their forum (or real names) and city/state or province/country of residence posted on the front page of the City of Heroes® web site (http://www.cityofheroes.com). To showcase our members of the game community, winners who have reached the age of 18 may be asked to answer some questions, provide personal information or to send Sponsor a personal headshot photo. The winner can decline to provide any or all the information in the prior sentence with respect to postings on the web site only. This information will be used to recognize the winner on the pages of http://www.cityofheroes.com and/or http://www.cityofvillains.ca but is not necessary to claim prize. By entering into the contest, (a) you agree to all of the terms and conditions of these Official Rules and Conditions, (b) you warrant that your entry is your own original work and that it does not violate any rights of any third party (including, without limitation, any publishing rights of any third party, or is libelous, obscene or otherwise contrary to law), and you assign and agree to assign to Sponsor all rights, title and interest, including, without limitation, copyright, in or to your entry. (d) you agree that Sponsor may post your user or forum name (or real name) and hometown on Sponsor's website and in any and all publicity and advertising for Sponsor, this Contest or other promotions by Sponsor without any further attribution, notification or compensation to you, except where prohibited by law, (e) you agree to be contacted by Sponsor or its agents by telephone, mail or e-mail, and (f) you agree to sign the documentation set forth in Section 5 above (or have your parent or guardian sign such documentation where applicable or requested by Sponsor). Entries become the property of Sponsor and will not be returned. By participating in this contest, you agree that Sponsor may post your screenshot/photo entries on the Official City of Heroes® Web Site (http://www.cityofheroes.com) on the Official City of Heroes ® Message Board (http://boards.cityofheroes.com) or on http://www.cityofvillains.ca at anytime during the contest along with your forum name (or real name) and city/state or province/country of residence. Sponsor, in its sole discretion, may edit and modify any submission before posting. Sponsor and its parent company, affiliates, subsidiaries, advertising, promotion and publicity agencies and all of their respective directors, officers, employees, agents, representatives, successors and assigns are not in any way responsible or liable for damages, loss or injury resulting from participation in this contest or acceptance, loss or use of any prizes awarded in this contest. You further agree that in any cause of action, Sponsor's liability will be limited to the cost of entering and participating in the contest, and in no event shall Sponsor be liable for attorney's fees. You waive the right to claim any damages whatsoever, including, but not limited to, punitive, consequential, direct, or indirect damages. Except where prohibited, you agree that any and all disputes, claims and causes of action arising out of or connected with this contest or any prize awarded shall be resolved under the laws of the State of Texas, without respect to any conflict of law issues, and entrant agrees that such shall be resolved individually, without resort to any form of class action, and exclusively by the U.S. Federal and State Courts of Travis County, Texas, U.S.A. You assume sole liability for injuries, including personal injuries and/or damage to property or prize, caused or claimed to be caused by participating in this contest or the acceptance, loss, shipment, or use of any prize awarded. Sponsor is not responsible for any failure to contact entrants, whether due to technical or human error. All of Sponsor's decisions regarding the application and interpretation of the Rules are final. The winners of this contest will be posted on http://www.cityofheroes.com on or about November 14, 2008. A list of winners can also be obtained by sending a self addressed stamped envelope to City of Heroes/City of Villains Costume Contest, NC Interactive, Inc., 6801 N. Capital of Texas Hwy., Building 1, Suite 102, Austin, Texas 78731. Residents of Canada may omit return postage. This contest is sponsored by NC Interactive, Inc. Corporation, 6801 N. Capital of Texas Hwy, Bldg1, Ste102, Austin, TX 78731. The Contest is prize sponsored by AMD. © 2008 NC Interactive, Inc. All rights reserved. NCSOFT, the Interlocking NC Logo, PlayNC, CITY OF HEROES, CITY OF VILLAINS, and all associated logos and designs are trademarks or registered trademarks of NCsoft Corporation. Cryptic Studios is a trademark of Cryptic Studios, Inc. All other company and product names are trademarks or registered trademarks of the respective owners with which they are associated.